Jill Sims, community relations team member for the Washington, D.C., metro team, recruits organizations and volunteers to work with Operation Christmas Child, a Samaritan’s Purse project. 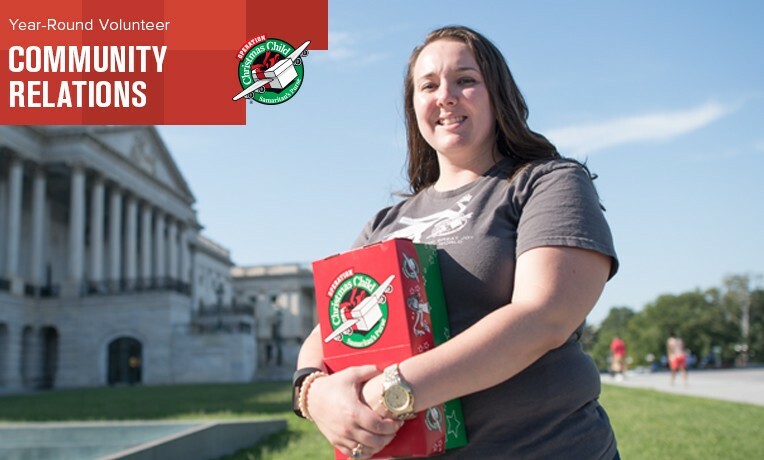 “Volunteering with Operation Christmas Child is very flexible around my schedule,” said Jill, a scheduler in the U.S. House of Representatives. Jill first volunteered at the Minneapolis Processing Center with her youth group growing up. Later, when she got involved in politics, she appreciated the positive environment of the organization. “When I moved to a new city, I wanted to be involved in something bigger than myself and be part of a team that was working to help people all across the world,” she said about her recent move to Washington, D.C. The uplifting nature of the project balances the negativity she faces on any given workday. “Every day I do some work with Operation Christmas Child, I feel like I’m making a difference,” Jill said. “I really love that it shares the Word of God. It’s so heartwarming and so positive. We have an opportunity every day to make the world a better place and to invite people to let God in their hearts. This article is part of our January series highlighting year-round volunteers who serve through Operation Christmas Child. Click here to find out more about volunteering with Operation Christmas Child, a Samaritan’s Purse project.